Prices kept on falling at its lowest in December! Well folks, care for the numbers….Lakeland’s average sold prices dropped to $134,365, a 30% stumble from the previous year. This is the lowest I’ve seen so far closing out this eventful year of foreclosure crisis, wall street and main street crisis, mortgage mess and bail outs. The average square foot of the sold homes for December was $76.03 per sq. ft., compared to the listing price of $81.36 per sq. ft. in Lakeland which is within the approximate numbers of our neighboring cities, such as Winter Haven, Auburndale, Bartow, Mulberry, and Polk City. Although real estate agents have a tendency to say that December is one of the slowest months of the year. Home sales by the numbers however have increased by 15% – 135 homes sold from the previous month in Lakeland. An increase of 15% in number of home sales though it is an average number. Check out the graph here, overall the average list price is just about over $140,000 since the beginning of this year in Lakeland. The average sold price so far this year amounts to $134,000 in Lakeland. Distressed properties are homes in pre-foreclosure, foreclosure, bank owned, as well as short sales – a continuous increase of distressed homes sales will certainly affect the real estate market and home values in Lakeland. Of the 135 homes sold last month homes 51 homes were sold with an average sales price of $123,543 compared to only 16 homes that were sold the previous year, due to Short Sales and/or Foreclosures. There are currently 491 homes facing foreclosure. 139 homes are in pending status waiting for bank or lender approval to close. In Lakeland, you will find distressed properties in every price category. The average price currently listed is $139,627. The priciest home currently on the market is listed for $750,000 and the lowest priced home is $15,000. Winter Haven – 59 properties sold – average sold price $126,543 – average $70.26 per sq.ft. Bartow – 12 properties sold – average sold price $126,362 average $70.77 per sq.ft. Mulberry – 7 properties sold – average sold price $145,755 – average $80.05 per sq.ft. Auburndale – 16 properties sold – average sold price $172,696 – average $82.83 per sq.ft. Polk City – 6 properties sold – average sold price $130,408 – $72.75 per sq.ft. The month of August was not very encouraging for Lakeland when considering the amount of properties sold and average sold price, comparing the data to the past statistics. The amount of units sold decreased further down to 129 from the previous month of 142 homes sold. The average sold price for August was $156,708 in Lakeland alone, which is a decrease of 5% from the previous month. The time it took a home to sell was an average of 162 days. Do you remember what a home sold for on average in Lakeland in August 2007? The average sold price for a residential home was $192,467. The total residential properties sold were 199 units. The average days on market were 141 days. Take a look at my spreadsheet below. I’ve separated the report by zip code instead of school zones; it gives you a more accurate report in my opinion. The data for this report was obtained from the Mid-Florida Regional MLS, it is deemed reliable but not guaranteed. This report does not include “For Sale By Owner”. 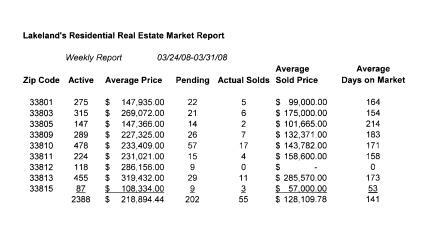 The average sold price in Lakeland Florida for the month of August 2008 was $156,708 and as you can see only 5 zip codes reached above average sales price (highlighted) for the month of August. Lakeland’s current inventory reached 2,334 of residential homes in active and 256 homes in pending status. Distressed properties are homes in pre-foreclosure, foreclosure, bank owned, as well as short sales – Of the 129 homes sold last month, 28 homes were sold with an average sales price of $132,682. Only 11 homes were sold the previous year, due to Short Sales and/or Foreclosures. Interested in Lakeland properties facing foreclosure or short sales? There are currently 410 homes facing foreclosure. 83 homes are in pending status waiting for bank or lender approval to close. In Lakeland, you will find distressed properties in every price category. The average price currently listed is $158,940. The priciest home currently on the market is listed for $750,000 and the lowest priced home is $24,500. With well over 2,000 homes on the market in Lakeland alone, what does it take to sell your home? Pricing is the most significant factor to get your home sold. Buyers interested in your Lakeland home will search your neighborhood until they find the best priced home. 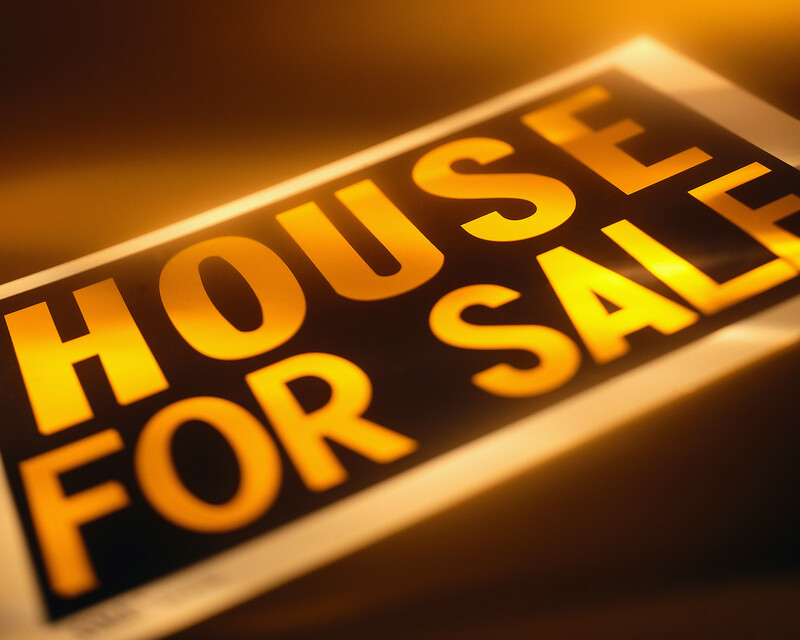 Look around yourself in your neighborhood, which homes have sold recently and which homes are still on the market? Chances are homes priced well above are still lingering around and will be there for many more months. You definitely don’t want to chase the market with lowering the price every 30 days. Check out the graph here, there is still a big gap of the average list price vs. the average sold price for the year 2008. To lower the inventory on hand, the gap must approach towards the average sold price. Winter Haven – 64 properties sold – average sold price $159,606 – average $89.56 per sq.ft. Bartow – 12 properties sold – average sold price $108,375 – average $72.54 per sq.ft. Mulberry – 10 properties sold – average sold price $104,091 – average $68.17 per sq.ft. Auburndale – 7 properties sold – average sold price $159,142 – average $86.68 per sq.ft. Polk City – 9 property sold – sold price $135,944 – $75.99 per sq.ft. Not much of a difference happened in terms of properties sold in Lakeland Florida for July 2008. The amount of units sold decreased slightly to 142 in July 2008 from the previous month of 149 homes sold. The average sold price for July was $165,063 in Lakeland, which is a decrease of 7% from the previous month. The time it took a home to sell was an average of 166 days. Take a look at my spreadsheet below. I’ve separated the report by zip code instead of school zones; it gives you a more accurate report in my opinion. The data for this report was obtained from the Mid-Florida Regional MLS, it is deemed reliable but not guaranteed. This report does not include “For Sale By Owner”. 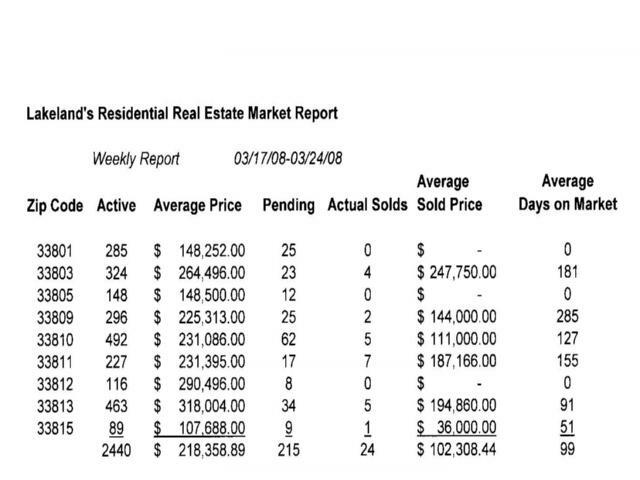 The average sold price in Lakeland Florida for the month of July 2008 was $165,063 and as you can see only 4 zip codes reached above average sales price (highlighted) for the month of July. Lakeland’s current inventory reached 2,336 of residential homes in active and 245 homes in pending status. Distressed properties are homes in pre-foreclosure, foreclosure, bank owned, as well as short sales – Of the 142 homes sold last month, 34 homes were sold with an average sales price of $108,256. Only 3 homes were sold the previous year, due to Short Sales and/or Foreclosures. We are always hearing the news about foreclosures, so let’s take a look what currently takes place in Lakeland. There are currently 422 homes facing foreclosure, are bank owned or sellers trying to go through the long and tedious short sale process. However, 84 homes are in pending status waiting to close. What are the average prices for these types of homes? The average price currently listed is $163,746. The priciest home currently on the market here in Lakeland is listed for $649,900 and the lowest priced home is $29,000. 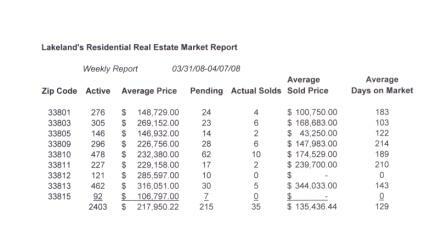 Check out the graph here, there is still a big gap of the average list price vs. the average sold price for the year 2008. To lower the inventory on hand, the gap must approach towards the average sold price. August starting out promising with the gap closing in, hopefully it will continue so the supply will drop and demand will increase. Winter Haven – 63 properties sold – average sold price $155,073 – average $89.91 per sq.ft. Bartow – 14 properties sold – average sold price $118,679 – average $68.88 per sq.ft. Mulberry – 12 properties sold – average sold price $130,800 – average $70.38 per sq.ft. Auburndale – 11 properties sold – average sold price $137,755 – average $82.85 per sq.ft. Polk City – 1 property sold – sold price $154,900 – $75.49 per sq.ft. March Home Sales Improved overall in Polk County according to the Lakeland Ledger Report. With all its negative publicity that the Real Estate Industry has, it is a positive sign that the media finally has something encouraging to write about Real Estate. What does the statistics say for Lakeland, Florida? According to the data obtained from the Mid-Florida Regional MLS there were 159 homes sold in Lakeland compared to last years 188 homes sold – a decline of 32 homes. The average sold price for a home in Lakeland was $152,761 last month. Last year’s average sold price was $185,497 in March – a plunge of 17%. Of the 159 homes sold there were 25 homes sold in distress – short sale, pre-foreclosure, foreclosure, and/or bank owned. The average home sold in distress last month was $104,662. My report below is a breakdown by zip code which gives you a detailed view of each area with last year’s market information. The data for this report was obtained from the Mid-Florida Regional MLS, it is deemed reliable but not guaranteed. There is some good news on the horizon when you compare March 2008 data with the total amount of properties sold in February 2008. There was an increase of 24 more homes sold in March. I don’t want to speculate on the coming month of a continued increase in home sales, I do notice more calls on my listings as well as buyers looking for great deals. If you are interested in a specific area or neighborhood, feel free to contact me at petra@petranorris.com for more information.